You may find that you have different feelings from other people with cancer. This doesn’t mean that you aren’t coping with your illness. When you are trying to come to terms with an illness there is no right or wrong way to feel. Everyone is different and you will deal with things in your own way. So you can take what you need to help you from this section. Ignore anything that doesn’t seem to apply to you or to help. Being diagnosed with cancer is likely to bring up many emotions. Most people feel shocked when they are told they have cancer, and don’t know what to think. You may be confused, upset and worried. Your feelings may not all be negative. Need to have the same information repeated to you. Needing to have information repeated is a common reaction to shock. You just can’t take anything in at first. Your disbelief may be so strong that you find it difficult to talk about your illness with your family and friends. Or you may find that you need to talk about it over and over again to help the news to sink in. At times, it may feel like an emotional roller coaster. One day you might be quite positive and able to cope. But the next day you could feel so sad and anxious that coping might not seem so easy. All these feelings are completely natural. Prefer to talk about it as little as possible or not at all. This is another completely natural reaction. If you feel this way, you can tell the people around you quite firmly that, for the time being, you don’t want to talk about your illness. But in extreme cases, denial can be unhelpful. Some people deny their cancer so firmly that they convince themselves that either they aren’t ill at all, or that their illness isn’t cancer. If this reaction starts to get in the way of your treatment or makes your overall situation even worse, you may need professional help from a psychologist or counsellor. People can react in this way because they are frightened of cancer themselves. They may be embarrassed by talking about it. Or they may be terrified that someone they love has a life threatening condition. If they don’t talk about it, they can try to pretend it isn’t happening. Explain that talking to them about your illness will help you. Not rushing into talking about the illness. Sometimes it is enough just to listen, letting the person with cancer talk when they are ready. Take your cues from the person. If they get upset, that is okay. It can be a relief for them to be able to cry and say if they are finding things difficult. Will I be able to get myself together and enjoy the things that I used to – even my husband or children can’t seem to make me feel happy any more? People say I must be positive – am I harming myself when I feel so low? All these thoughts, feelings and questions are very natural and completely understandable. Your family and friends may expect you to feel back to normal once your treatment finishes. But many people with cancer find that this is the time when the emotional impact of their diagnosis hits them and they need more support. You may miss the support from the doctors and nurses at the hospital. And some people say they feel a bit abandoned as they no longer belong to their hospital team in the way that they did when they were having the cancer treatment. If your cancer is very advanced and you are facing the possibility of dying, all these feelings are likely to be more intense. They will take on a different meaning. Having negative feelings can be very draining for you and the people around you. You might find that family and friends don’t understand. Or they may try to tell you how you should feel. This can put a big strain on your close relationships. Talking about your situation really can help. If you would like to share your feelings with someone, but don’t feel you’re able to talk to your friends and family, it may help to talk to a counsellor. Don’t feel you are being weak by asking for help or letting someone know how awful you feel. It is not a weakness. Talking about how you feel is more likely to help you and the people around you than staying silent. Doctors and nurses in cancer care are very aware of the range of reactions people can have to cancer. There may also be counsellors or psychologists in the cancer team at your centre. They can help you through difficult, emotional times after your diagnosis, during treatment and afterwards. They will be ready to listen to you, give you support, and suggest ways to help you feel more positive about things. Short stays to give you and your family a break (respite care). 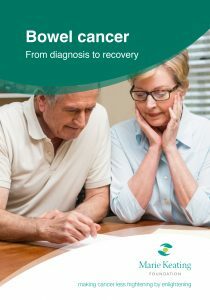 In the section ‘Cancer Support’, there is information about psycho-oncology and complimentary therapists at cancer support centres in Ireland. If you would like to talk to someone outside your own friends and family, look at this section.